The Tourist Club welcomes guests to our club for our annual festivals and other special events that our posted on our Calendar. We are closed to guests at all other times. On those occasions when we are open to guests, our members volunteer to staff the club, and they are happy to talk to guests about our club, its mission, our activities, and membership. It is the responsibility of every guest to the Tourist Club to be familiar with and to abide by our Guest Rules. No outside alcoholic beverages are permitted at any time. Each guest must have a valid ID proving legal age to purchase or consume alcoholic beverages. Alcoholic beverages must be consumed in designated areas and cannot leave the premises. No persons under the age of 21 are allowed in our Bierstube (bar). Visitors may not drive a vehicle or ride in a hired vehicle on the club's private access road. Reaching our lodge requires a minimum of a half mile hike. See Directions for details. All smoking and vaping is restricted to the gravel area immediately inside the back gate at the top of our property. Please be aware of fire risk at our club and on hiking trails. No outside food is permitted at Maifest, Sommerfest, Kinderfest, and other events as specified. Guests may bring a trail picnic on a Guest Day, but they must pack out their own trash. The dance floor and walkways are to be kept clear of people, blankets, ground covers, and paraphernalia during events. We do not allow groups with greater than seven (7) persons. Guests are required to obey signs indicating areas and tables reserved for members-only. Guests who ignore these rules will be asked to leave the club. We do not accept credit cards, debit cards, electronic payments, or checks. There is no ATM on the premises. All tables are first-come, first-served. We do not take reservations. Our club is not ADA accessible. There are numerous staircases, uneven steps, and trails that make navigating our 100+ year-old buildings and grounds challenging. An automated external defibrillator (AED) can be found adjacent to our workshop on the ground floor of the building containing our kitchen and dining room. A sign above the building entry indicates its location. There are first aid supplies in the Bierstube (bar) and the kitchen. The Tourist Club does not permit any service for hire, sale of products, business solicitation, or other commercial activities while at the club, or in connection with a visit to club property. The commercial use of the club's name, logo, brand, or images without authorization is prohibited at any time. Guests' dogs are not allowed anywhere on club property. Please, do not tie up your dog on the trail, on the club's access road, or anywhere else around the club. They are not happy, and their complaints disturb our neighbors. Besides, we love dogs, and we don't like seeing them treated that way. 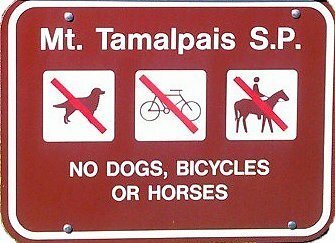 Guests should be aware that dogs are prohibited in Muir Woods National Monument, and are not allowed on Mt. Tamalpais State Park property (including Redwood Trail and Sun Trail) except for the Pantoll Campsite and the Alice Eastwood Road. Dogs are allowed in the Marin Municipal Water District, but must be on leash at all times. and be respectful of our neighbors. and we are all responsible for it.